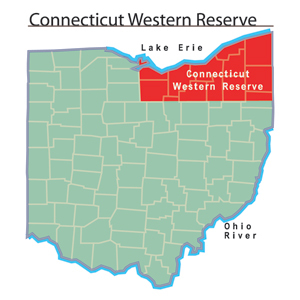 The Connecticut Western Reserve (also known as the Western Reserve) was an area in the Northwest Territory held, sold and distributed by the State of Connecticut in the years after the American Revolution. Connecticut was one of several states that had land claims in the Ohio Country going back to the colonial period. Connecticut gave up most of its claims to the federal government so that the Northwest Territory could be created. However, it reserved the northeast corner of the territory for itself. This area came to be known as the Connecticut Western Reserve. The Western Reserve had two parts. The western part of the region was known as the Fire Lands. The state gave plots of land in this area to people who had lost their property in the American Revolution. The Connecticut government sold the eastern portion of the reserve to the Connecticut Land Company in 1795. The $1.2 million earned through the land sale was spent on public education in the state of Connecticut. The Connecticut Land Company sent General Moses Cleaveland to survey the territory and lay out townships. In federal surveys such as the Seven Ranges, townships were 36 square miles. Cleaveland created townships of 25 square miles. One of the earliest towns established in this region was named Cleveland in his honor. It appears that Cleveland was originally spelled as Cleaveland, but a mistake by a mapmaker resulted in the new spelling by the 1820s. Many people moved into the Western Reserve because it was accessible from Lake Erie. In the early years of settlement, many people from New England came to the Western Reserve. For the first several years, settlement of the land owned by the Connecticut Land Company proceeded slowly. When Connecticut sold the land to the company, the state gave up all rights to govern the land. The federal government did not consider the Western Reserve to be part of the Northwest Territory until 1800, and thus, the federal government provided residents with no legal or military protection. Unlike the Ohio Company and Associates, which made provisions for education and religious institutions, the Connecticut Land Company was only concerned with selling its lands and left future development of the region up to its new inhabitants. By 1800, only about one thousand people lived in the Western Reserve. Because of its lack of success in selling its land, the Connecticut Land Company was dissolved in 1809. Much of the settlement of the region did not occur until after the War of 1812. Settlers in the western part of the reserve faced struggles with American Indians over ownership of the land. The westernmost part of the Fire Lands had been granted to American Indians in the Ohio Country territory as part of the Treaty of Greenville of 1795. As the population increased, Ohio American Indians were forced from the region. Hatcher, Harlan. The Western Reserve: The Story of New Connecticut in Ohio. Indianapolis, IN: Bobbs-Merrill, 1949. Lupold, Harry F., and Gladys Haddad, eds. Ohio's Western Reserve: A Regional Reader. Kent, OH: Kent State University Press, 1988. Kirtland, Turhand. Diary of Turhand Kirtland from 1798-1800: While Surveying and Laying out the Western Reserve for the Connecticut Land Company. Poland, OH: n.p., 1903. Whittlesey, Charles. Early History of Cleveland, Ohio, Including Papers and Other Matter Relating to the Adjacent Country, with Biographical Notices of the Pioneers and Surveyors. Cleveland, OH: Fairbanks, Benedict & Co., Printers, 1867.